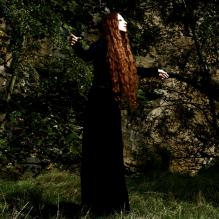 Dark folk / gothic project Darkher just inked a long-term contract with Prophecy Productions. A first outcome of it will be the release of an EP later this year, before Darkher’s debut album will be out in 2015. Darkher is the alias of Jayn H. Wissenberg, a charismatic West Yorkshire-based singer-songwriter, behind whose fragile elegance lies the creator of a powerfully emotive work. Her captivating music is characterized by slowly building storm clouds of guitars and even more Jayn’s haunting, spine-tinglingly evocative voice. It is unprecedented dark music full of contrasts, at once powerful and fragile, wracked and serene, combining a feel of both chilling loneliness and the warmth of hope and it is veined by an atmosphere of esoteric splendor and a deep spiritual confidence. According to Prophecy Productions: “Without exaggeration, in our eyes, Darkher is one of the biggest contemporary talents in the field of dark and atmospheric guitar-based music”!